Each of our Certified Hondas have been through a complete 150 point certification inspection and service by one of our Honda Certified Technicians. What does that mean to you? Through this process, we inspect everything on the vehicle including brakes, tires, fluid flushes, recommended next service, filters, electrical and all engine components. If any of these do not meet American Honda’s standards, we replace them. In addition we will do a full visual inspection of the body and wheels, etc. All blemishes are corrected in advance. With each Certified Honda car you get a full 7 year 100K Warranty on the Powertrain and a Full 1 Year 12,000 mile Bumper to Bumper Warranty with a zero deductible. This warranty can be used at any Honda Dealer in the U.S and backed by American Honda. 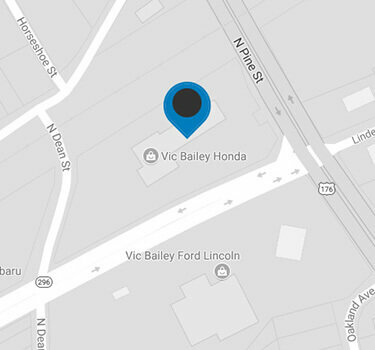 Buy with Confidence at Vic Bailey Honda! We have one of the largest inventories of certified Honda cars in the upstate. CARFAX One-Owner. Local Trade, Exterior Parking Camera Rear.